A Parent's Life to Behold, Through the Eyes of Insanity-n-Bliss...: A Giveaway, Benefitting You and the Planet! You are about to enter a giveaway! Yes you are! Happy happy dance! A lovely company called ecostore, originally based out of New Zealand, contacted me for a review and a promotional giveaway for their line of natural, chemical-free household products! 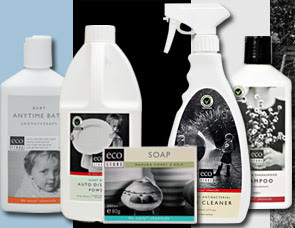 For 15 years, ecostore has made their products with a "passion for improving the planet while providing products that are safer and healthier for your family", from spray cleaners, to pet products, to soaps for your baby's skin. I have been given the wonderful opportunity to sample several products, which ecostore states, "are just as effective as the leading supermarket brands" and let me tell you, THEY ARE! And the best thing is, they are expanding HERE in the US to all the MEIJER stores, and can be found on line here! About the product: This citrus cleaner has a subtle, yet fresh, lemony scent, and sprays in a very fine mist, which is great since their products are concentrated, meaning you cover a lot of area at once without over-using the product. It's great for kitchen surfaces and most household surfaces (you may need to do a test-spot on more delicate surfaces, per website instructions) and when diluted is great for mirrors and glass. 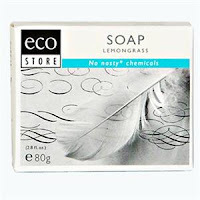 This product is a "natural alternative to petroleum based solvents" and is naturally antibacterial! It comes in a 17 fluid ounce spray bottle, and there are refill bottles to buy subsequently. How did it work? : This cleaner works GREAT! I love the fine-mist, as I know I am really covering an area thoroughly. I also love that I don't have to wipe again with water since it is not made with any "nasty chemicals". The citrus spray is strong too! I erm...spilled some, red wine, (shh!) on my counter top and it left a nice little stain. The citrus spray cleaned it right up! The citrus component makes it a great solvent for scum in your sink, and even is great on bathroom surfaces like your tub! Would I buy this product again? : Absolutely! About the products: The shampoo has a very light and soothing scent of orange and rosemary. It comes in a 6.8 fluid ounce bottle and contains all natural ingredients. How did it work? : Shampoo is a hard one for me, as my hair is very thick and oily. This shampoo got my hair squeaky clean with one application (sometimes I have to sud twice!) I normally love super smelly shampoos, but I will say more about that in a minute. I was pleased I didn't have to use a ton of it to get my hair clean, as I only wash my hair every other day, so as you can imagine, I need a good shampoo! Just for fun I switched back to my old shampoo, and was shocked to find that the apple smell I once loved smelled like ammonia to me! No joke! I did not enjoy it like I once did! And, my hair did not get as clean; it still smelled "oily" after drying my hair, where with ecostore's shampoo not only was my hair clean, but my scalp was too! The conditioner was a pleasant surprise as well! My hair didn't feel like a grease slick, but it detangled amazingly! I was actually shocked to be quite honest; I usually need something shy of butter to get my hair to detangle. And once I blew my hair dry, my hair was shiny, I mean REALLY shiny! Again my hair smelled clean with no over-powering scents, and most importantly it WAS clean! Oh yeah, I have color on my hair, and it didn't strip the color or cause it to fade, which is nice as I am vain and want my gray covered! About the product: This 35.3 ounce container uses natural oxygen producing whiteners and plant based ingredients to whiten clothes. ecostore promotes this product, saying it "brightens and cleans baby's clothes and does not contain any harsh chemicals that could irritate delicate skin". How did it work? : I dissolved the whitener in the washer with water as the directions dictated, and I threw in my towels with my usual detergent. I dried my towels my usual way and set up for a comparison. The towels were just as white and just as soft with one important difference; the towels I washed with the whitener smelled clean! And by clean I mean like when you dry your clothes outside! The freshness compared to the other towels washed normally was amazing! 35 ounces is a lot of whitener, and I will have plenty for loads and loads of whites to come! Now it's time for you to try these products! And ecostore is giving you that chance by allowing me to host a giveaway! Simply comment on this post and you are entered to win a $25 gift certificate and two body soaps! Please visit their website and become familiar with their products, visit their FAQ's, and their BLOG, and then head to any MEIJER store to find this line that is gentle on your budget and family! If there are no MEIJER stores in your area, order on-line! Thank you to ecostore, for this opportunity to review your wonderful products and for providing such a generous giveaway!! Good luck everyone! I use Shaklee products right now, but would love to try a new eco-friendly brand. I also shop Meijer every week, so I'll check out the products!! Thanks for doing such a great give away! Thanks for recommending this..I love natural (non-chemical) products and am going to look for this at Meijer's...Can't wait to try their products! Awesome looking (and sounding) products! I love natural stuff, hence my obsession with handmade soaps... so this is right up my alley! amazing. please enter me 35 times. or just the one time. i'm definitely interested in their soaps. ecostore sure is generous with this giveaway! thanks for hosting it! This would be a great product to try. Thanks for the great giveaway. Okay, I seriously thought you were using creative spelling of "major" (like we used to...just in a new way) for the name of that store. I thought I could buy these products at any MAJOR store! Ha ha! The stuff sounds wonderful! Consider me entered! Your eco-groovy and natural product-lovin' friend! Awesome giveaway. I now use Method products, but I love anything that's good for the environment. Thanks. I love giveaways! I have a Meijer a few miles from me. I will check it out. I like the Seventh Generation stuff, but can't always find it in the stores. "Tom's" makes a good all natural toothpaste, one in strawberry that my daughter likes. My son was allergic to OxyClean, when he was younger, which is also supposed to be all natural and good for the environment, so I, personally, would still be leery when trying it without a side by side comparison. Thanks for previewing these items! I'm going to keep an eye on them. Looks like these products are my kind of ecofriendly stuff! Thanks for following my blog,I'll be reading yours too. their products look great - I'd love to win! This could be my first step (outside of recycling) into the realm of going green! *gasp* Thank you for taking the time to try the products so thoroughly! Makes me want to look into them even if I don't win! I'm having trouble with my hair these days, so maybe their conditioners would help. Thanks for the reviews. Hook me up, girlfren. I would love to try some eco-friendly products. Plus, I have a big red fruit punch stain on my kitchen counter that I have no idea how to remove. I need help. Awesome goodies, I can't wait to try them!! I have been trying to find more ways to go green and this whole line covers it all from cars to pets!!! Im amazed and hoping to win!!! This looks like great items!! 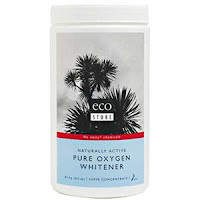 I'd like to try the Coconut soap and the Pure Oxygen Whitener. I'd love to try the Front Loader Laundry Powder and the Oxy Whitener. Thanks! These products sound great! I'm always on the lookout for inexpensive and natural cleaning products. With three little ones running around, there is always a mess to be cleaned somewhere. Hey Kim, I am still alive. This is the first day I have even checked my own blog. I have NOT felt good at all, it's worse this time around. I'm hoping that I will get over this soon because I'm about to lose my mind! One of these days I will have to go back and read all of your recent posts because I have missed them all. Oh, and I don't know why my sis hasn't posted anything, just busy I guess. yo kim! i am so glad that we have this whole "natural cleaning" thing in common. so many household cleaning products are so bad for us! love ya! hope i winnnnnnnnnn!!!!!!!!! Oooh, this sounds great! I have a baby in the house and am always looking for non chemical cleaners that ACTUALLY work. so, pick me, pick me! heidi_and_mannyatyahoodotcom. Oh these look great....here's hoping! This line of products sounds great. I love that they are reasonably priced and safe for even my baby. I am especially interested in the whitener; it sounds wonderful. I need a good, natural conditioner SO bad. My hair is a freak of nature. Seriously. Also, on your profile, your random question was "If you could peer far enough into the night sky, you'd see a star in any direction you looked. When would you sleep?" Except I thought it said "If you could PEE far enough into the night sky..." and I was all, "That's so weird...how do you pee into the sky if you're not a dude?" and then I realized that that's not really what it said which is good because seriously...that would be weird. Also, please enter me into your contest because I really like to win stuff. Heylola (at) sbcglobal (dot) net. Thanks for a great giveaway! I'll have to try the shampoo! wow! So many great products to choose from! These products sound like they would be great and not bother my allergies. I live in the mountains and am therefore close to nature..or at least I feel closer! Thanks for entering me.Any of your coconut products sound great! Thanks for the chance for the great giveaway. i love giveaways, thanks for hosting this! WOW. I love that these are chemical free! I would love to try their products - alas, no Meijer nearby but I could order online. I'd love to try their coconut and lemongrass soaps. Thanks! I like that their products are at MEIJER stores. Fabulous review! I have their products here waiting for me to review them! I love Natural ..anything! I'd love to try the shampoo-I've been looking for some to try as it is. They sound good. I could use the whitner on my DH's undershirts. They get so dirty. Sounds great! I'd love to try them. Thanks for the giveaway! Fabulous! In addition to everything else, they don't test on animals. I'm sold! The products look great. I have yet to try them, but I am looking forward to it. Thank you for the giveaway. I had never heard of the product before. Looks like a great one. Hope I am lucky! Thanks.